“You agree that EA may collect, use, store and transmit technical and related information that identifies your computer (including the Internet Protocol Address), operating system, Application usage (including but not limited to successful installation and/or removal), software, software usage and peripheral hardware, that may be gathered periodically to facilitate the provision of software updates, dynamically served content, product support and other services to you, including online services. EA may also use this information combined with personal information for marketing purposes and to improve our products and services. We may also share that data with our third party service providers in a form that does not personally identify you. IF YOU DO NOT WANT EA TO COLLECT, USE, STORE, TRANSMIT OR DISPLAY THE DATA DESCRIBED IN THIS SECTION, PLEASE DO NOT INSTALL OR USE THE APPLICATION. The hitch here is that by clicking on the “I agree” check box you are giving your consent. We wonder how many people will be ok with this once they take a look at all of the facts. We will also be looking at EULA’s from other software distribution companies to see if theirs are any better in the next few days and will let you know what we find. 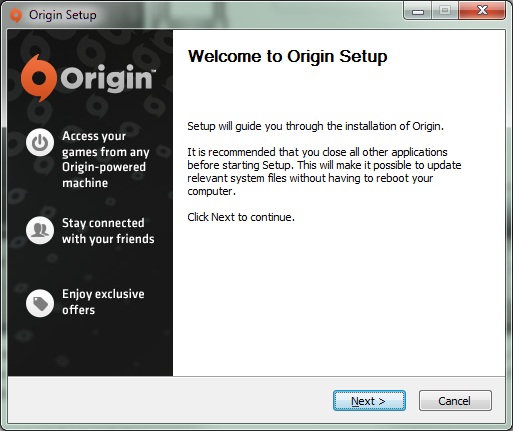 For now we would advise people to take caution with Origin, it is not only the online content distribution application, but the replacement for the EA Downloader for patches and updates… This makes me consider removing some of the EA games that I have.